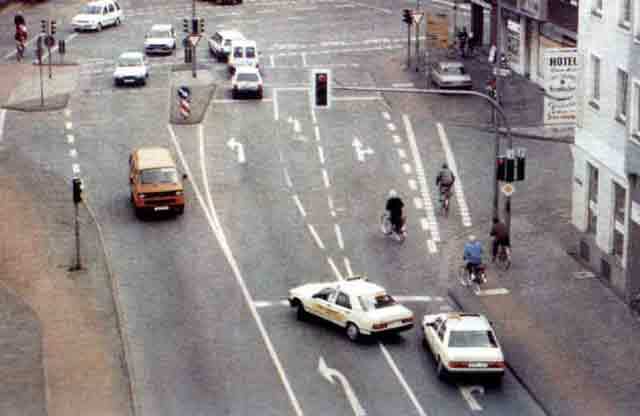 Bicycles traffic laws in Germany are worth knowing. 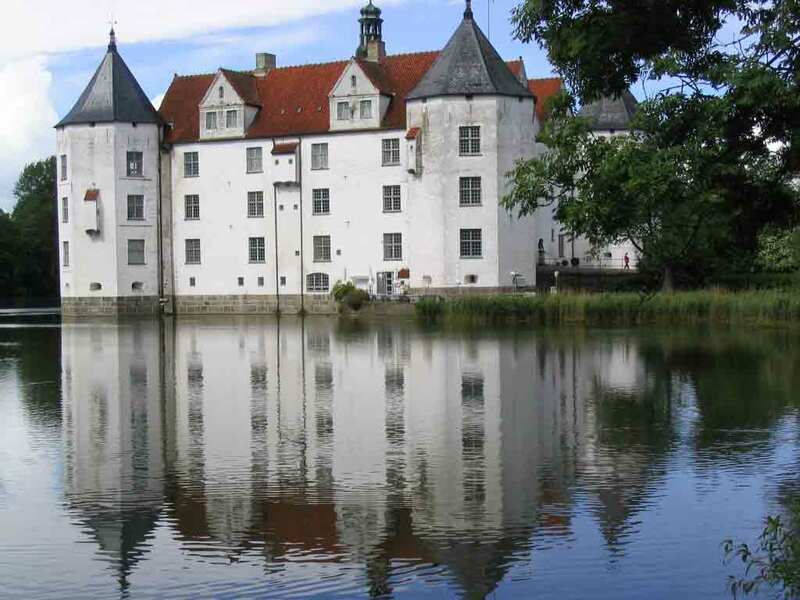 Generally, the laws of Germany are similar to those you may be used to in the US. E.g., do not kill anyone, ride on the right side of the road, and obey all traffic laws as if you were driving a car. 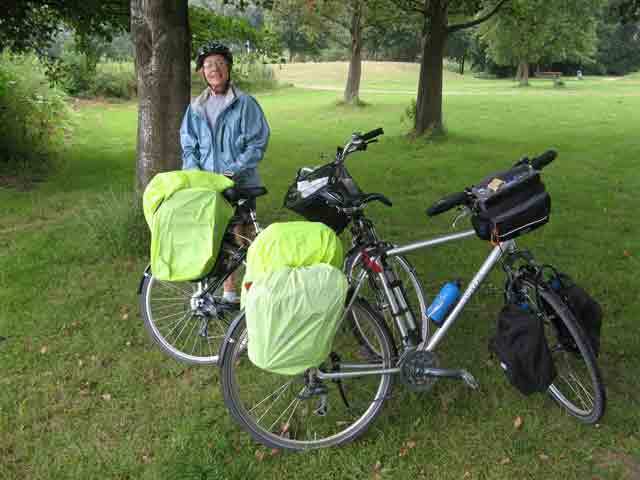 In Europe, everybody rides or has ridden bikes and drivers are tolerant of the challenges all bike riders have. Here are a few guidelines. 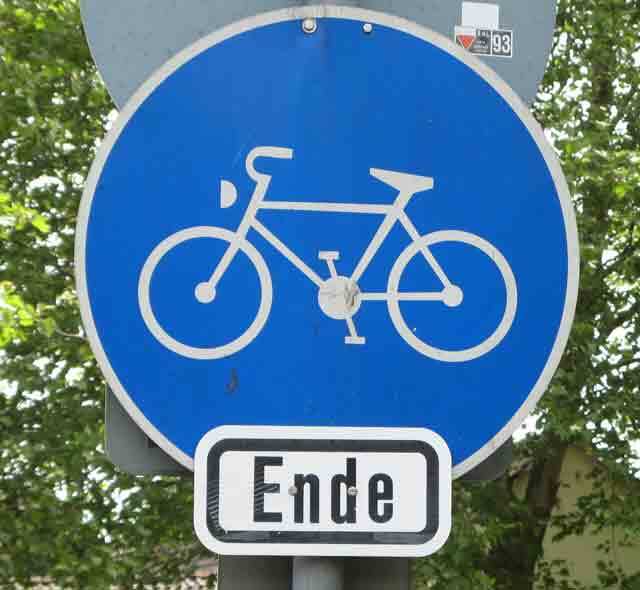 This page contains is my best attempt to provide accurate information about bicycle laws in Germany. Since 2011, there is a law that would find the cyclist responsible if that cyclist causes an accident by not obeying traffic laws. Cyclists can be found guilty of causing an accident, thereafter, made to pay damages. 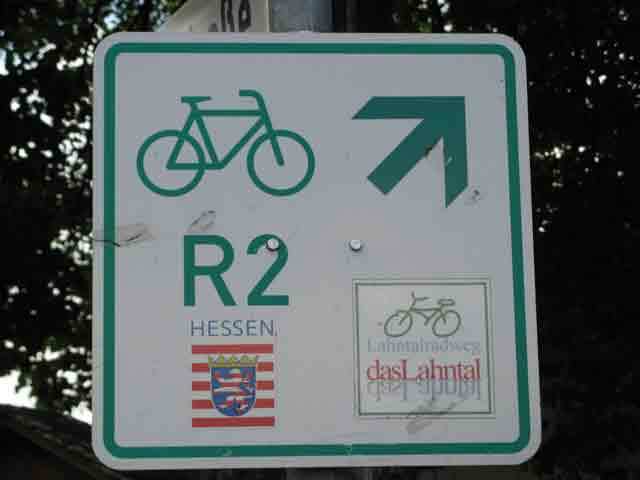 The following is extracted using Google Translations from the actual bicycle laws of Germany. I am not a fluent speaker of German so there may be a mistranslation or simply misinformation. 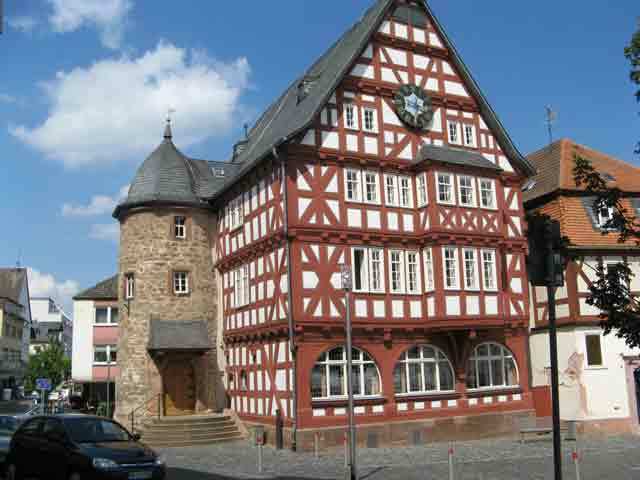 Therefore, Tim and Maxa Burleigh and BicycleGermany LLC have to disclaim the accuracy of the information on this page. Main Source: have been asked for a source of the translations. 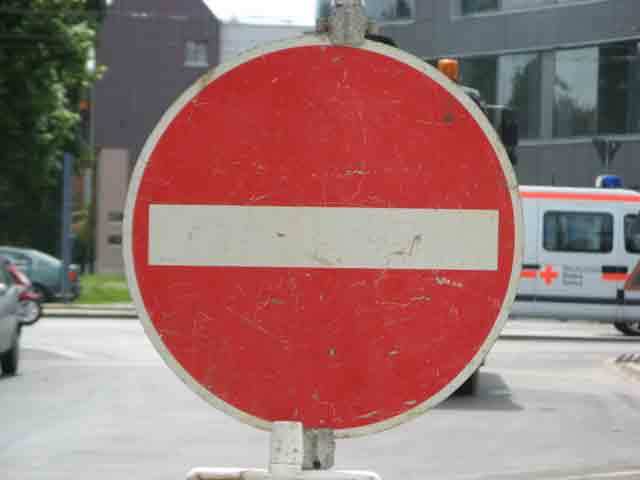 While they came from several websites, most of the information came from http://www.gesetze-im-internet.de/stvzo_2012 , which is a listing of the “Street Traffic Restriction Rules” (StVZO). You can see section headings in German, of course. You can paste them into Google Translate or similar translators if you German is a rusty as mine. Basic understanding: One of the guiding principles of traffic behavior is the Trust Principle; That is to say that drivers (of cars, bicycles, and other motorized vehicles) trust the behavior of other drivers and cyclists. The only exception to this basic rule is that of bikes ridden by impaired people or motorized wheelchairs, etc. driven by impaired people. 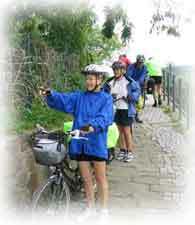 All cycle paths are at least separated from a road by a concrete retaining wall (Jersey barrier), a grass strip. A cycle path separated by a painted line is part of a road and is not a separate cycle path that allows side by side riding. Cycle paths also include those delineated on sidewalks where a curb separates the sidewalk path from the road or street. On some field cycle paths through farming country (Feldwege), one occasionally sees a car but more often you see tractors or other farm equipment. 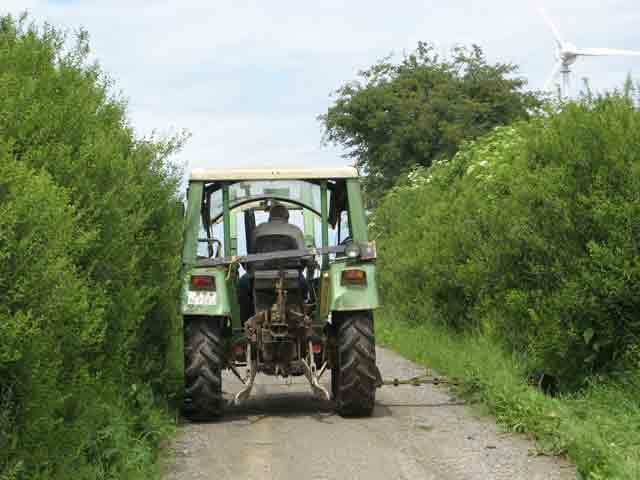 The tractors have the right of way and they typically take up the whole path. Cyclists should stop and get off the path. Arm signals: You must give a hand signal for all turns. (In America, one signals a right turn by bending the left arm at the elbow and raising the forearm as if to point over your head. That does not work in Germany.) Europeans point left with their left arm and point right with their right arm. The signal for stopping is one arm extended and the forearm pointing down - at least this is just like American traditions. For the stop signal, it is best to use the arm most likely to be seen by the traffic you want to know that you intend to stop. And be careful when you choose to use the arm on the side that controls the rear wheel brake. Yield to traffic on the right: Unless you are on a major through street with the yellow diamond, (see photograph) marking the way, you must yield to vehicles and cycles from the right. This is especially true on residential streets where arterials streets are rare. 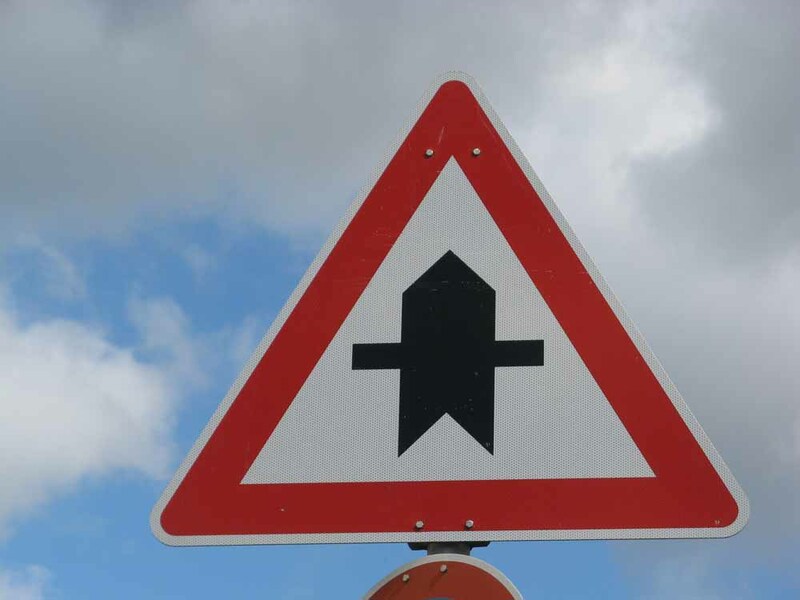 Another sign, shown below with a fat arrow in the direction of travel and two lines intersecting the fat arrow from the sides means that in this intersection only, you have the right-of-way. Yield to all traffic: If you are coming from a sidewalk, parking lot, driveway, or the like, you must yield to all traffic on the roadway. Those cars and other traffic are bigger than you and if you try to bluff them out, it will be hazardous to your health and hazardous to the condition of your bicycle. In Europe there is no right turn on red; you have to wait for the green light (unlike in the USA where it is legal to turn right on a red light if you stop first). Pedestrians always have the right of way: Normally, they cannot hear you coming unless you verbally announce yourself or ring your bell. Pedestrians in crosswalks (Zebrasteifen) always have the right of way even if they can see you. An intersection with only one painted crosswalk means that you may have to use that crosswalk. You may not cross wherever you want to. Also, if you walk your bicycle across, cars are required to stop for you and most cars do so. If you ride your bicycle across, you are no longer a pedestrian and laws relating to pedestrians no longer relate to you. If you cause an accident while riding a bicycle, you will be held responsible for damages. Making turns: If you are riding with traffic, turn out of the proper traffic turn lane. Again, you must obey automobile laws. The above said, there are many times when the cycle path is on the sidewalk. 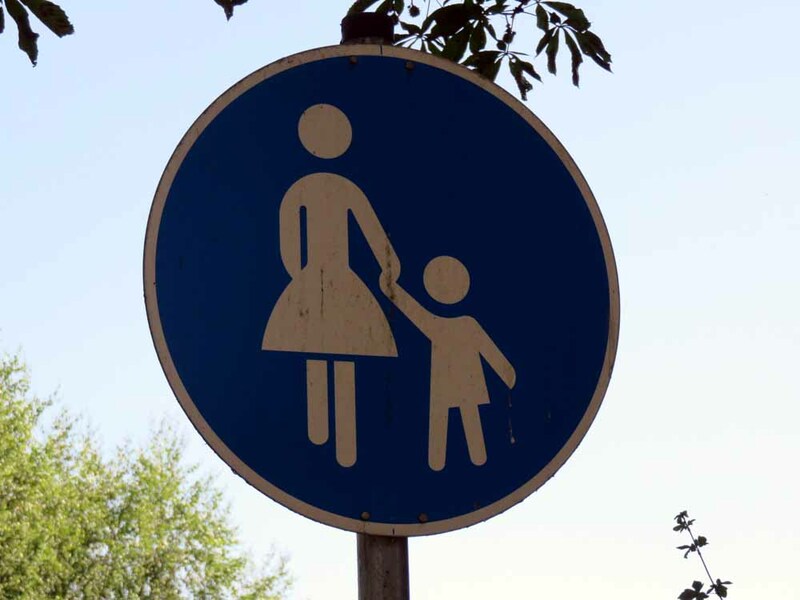 You will see a round blue sign telling you that you should share the sidewalk with pedestrians. The sign on the left means there is a separate part of the path for cycles and another for pedestrians. The sign on the right means you share equally. Remember pedestrians always have the right of way. If you are on the sidewalk you have to cross intersections with a walk signal. Get off and walk your bicycle across. [This is true even if there is no traffic but most cyclists ignore this often unenforced rule.] By the way, children up to age 10 must walk their bicycle across the street and only at crosswalks. 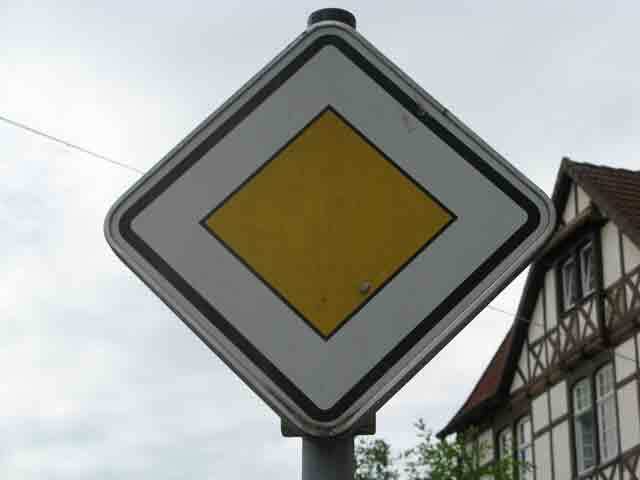 More information about fines and other traffic violation information for inquiring minds can be found at http://www.howtogermany.com/pages/traffic-violations.html and http://www.howtogermany.com/pages/traffic-violations.html. 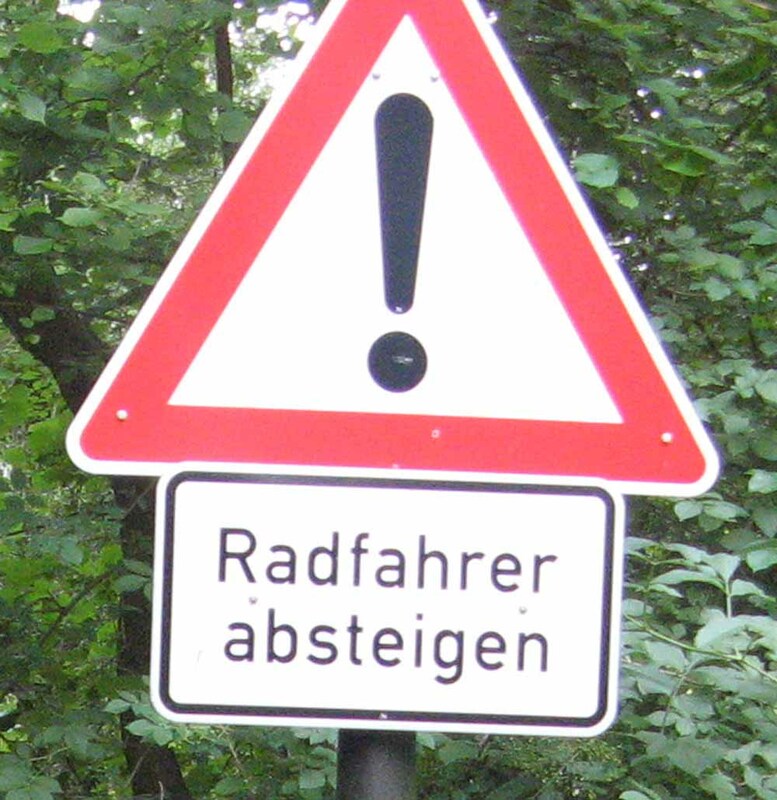 Traffic Violation Fines: As of 1 April 2013, if cyclists violate provisions of the Road Traffic Act (Straßenverkehrsordnung "StVO"), it now is more expensive than previously. 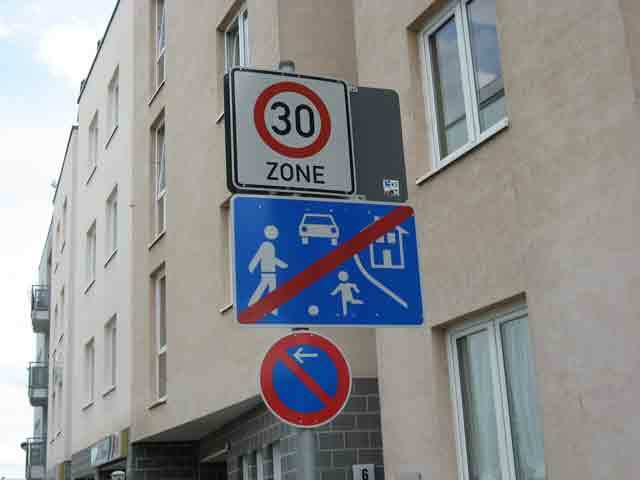 Fines may be as follows: failure to use the bike path - €20; riding without light - €20; riding on the sidewalk - €10; not using the right lane - €15; riding the wrong way on a one-way street - €20; riding in a pedestrian zone: €15. About drug use: If you drive [or cycle] impaired by drugs, you will face a fine between €800 and €3,700. Also Note: Police can arrest you if you pedal erratically and/or your blood alcohol limits exceed .05%. Use of cell phones: It is verboten to use a cell phone while riding a bicycle except when using a hands-free capability. Hefty fines are assessed when arrested. Brakes: Two independently acting braking devices. Bell / horn: For dispensing acoustic warning. Reflectors: front with a white with a red rear reflectors that may be connected to the lights and/or connected to the pedals. At least two yellow reflectors on each wheel. In daylight and good visibility bicycles may be used without lights. Racing bike exceptions: Racing bikes are not required to meet the above rules. However, if riding at night, all bikes, including racing bikes are required to have lights and reflectors. A side note it that electrical bicycles (E-bikes) are limited to 500 watts. Brakes: Two independently acting braking devices (mean deceleration on dry pavement m/sec2 4 at an initial speed of 20 km / h). Bell /horn: Required for dispensing acoustic warning. Reflectors: A white reflector on the front with a red reflector on the rear. At least two yellow reflectors, one reflector on each wheel (light entry surface 20 cm2). Alternatively, wheel reflective sidewalls seem to acceptable reflectors instead of attaching plastic reflectors to the spokes. In daylight and good visibility, bicycles may be used without lights. The law says that lights must be firmly attached to the bicycle but experts say that battery powered, detachable lights are permitted (light intensity 100 cd). [I do not know what "cd" means.] The law requires headlights to be "light sensitive surface at least 20 cm2" [I do not know what "cm2" means either]. Helmets: I cannot find a law in StVZO requiring helmets. [From a newspaper in Kassel I learned that as of May 2011 helmets are required by law for children under 13 years old. 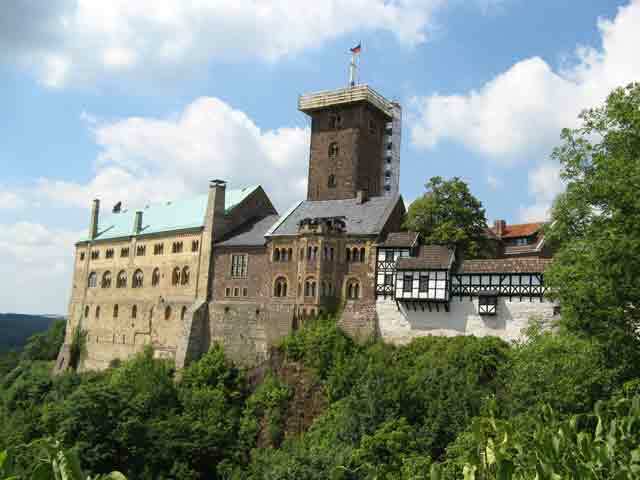 However, that is probably only a city rule or a rule in the state of Hessen. Before that, the rule of thumb was that children's helmets were not mandatory but strongly recommended. For older people, helmets are recommended but not required. The law provides the characteristics of a good bicycle helmet as: Hard outer shell made of reflective material Air vents, which are connected by wide, and air ducts Bars on the air vents to protect against insects [ever have a bee in your bonnet?] Closure straps which are fixed on the helmet and easy to open and close. Helmets should have the mark inside the shell that they conform to the ÖNORM EN 1078. Adults: Helmets improve visibility. Hazardous Loading: Carrying items on your bicycle that may cause an issue in traffic is forbidden. Such items include open umbrellas, saws, scythes, or other items that might cause damage or impaired maneuverability. Parking of Bicycles: Bikes must be parked so they don’t fall over and impede traffic or damage property. 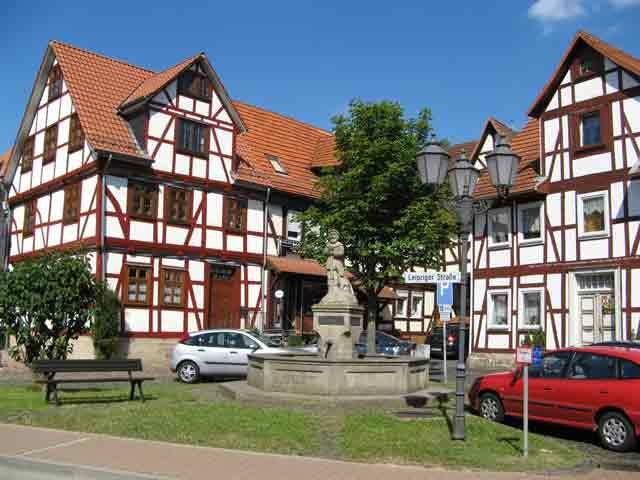 Other laws and suggestions: Many European streets are too narrow for cars to meet side by side and have a car parked in the street. What happens is that cars swerve out over the centerline to drive around parked cars. However, if a car is coming from the other direction and the parked car is in your lane, you must yield to the oncoming car. In other words, you must wait behind the parked car until the oncoming car (or cars) has passed before passing swerving out across the centerline to pass the parked car. This can get interesting when cars are parked on both sides of the road and cars must alternatively swerve in and out and wait and hurry. The locals have it down but it seems like pandemonium to me. Blind corners: When you are about to turn a blind corner, ring your bell to warn other possible riders or pedestrians coming toward you around the corner that you are there. What follows is excerpted with permission from http://pbisotopes.ess.sunysb.edu/bicycle-muenster/bicycling-muenster-2.htm by Gilbert Hanson. 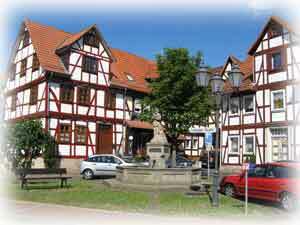 Some of the photos are attributed to "Program fahrradfreundliche Stadt Muenster." In the first picture to the left, the bike lane is part of the sidewalk. Bikes must travel in the same direction as traffic. That is, you must travel on the right side of the road. The red area is for bikes and the gray area to the right of the red area is for pedestrians. Note the sign. Occasionally, when there is no bike path on the correct side of the street, you will be directed to ride on sidewalk level but on the opposite side of the street where there is a bike path. The second picture to the right shows an intersection where the light is red and cars must stop behind the lower white line. Bicycles can wait between the two dotted white lines. Bicycles enter this area from the red bike path on the right. Note the arrows on the bike path and the entrance into the bike waiting zone. Frequently bike paths are indicated by a color change from that where pedestrian have the right-of-way. Note the third photo on left shows a bicycle path made from red stone but the pedestrian walkway is from gray stone. At the intersection in the lower left, the cars on a red light must wait behind the first (lowest) white line. Bicycles have a separate left turn lane in the center. Note how the bicyclers enter the left turn lane at a red light for the cars. These pictures may look confusing but they are logical when you are actually on the path. If there is no bike path or bike lane, think of yourself as if you are in a car and enter normal traffic, turning left or right as the cars do. Obey the same rules that cars do. Take an active, aggressive position in traffic (e.g., ride where the cars put their left wheels) and do not dawdle. But when there are bike paths, follow the arrows and the signals put there for bikes. 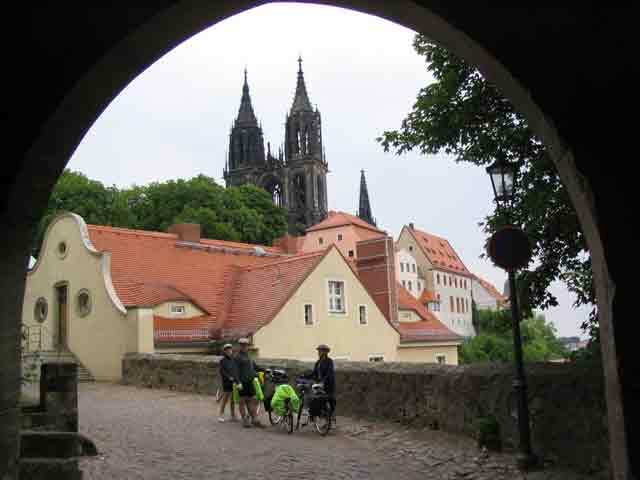 By the way, Germany has millions of bicycle commuters. Most of them would prefer you did not dawdle in the bike paths either. If you are riding in a train buy a ticket. That seems simple but once in Germany, it may appear that no one checks tickets. It is possible that is the case on streetcars but on trains, the conductor (Schaffner/Schaffnerin), normally will check tickets. They can even check the tickets you buy for your bicycle. There are signs posted on many conveyances warning you that if you do not have a valid ticket you have to pay the higher of €40 or double the price of a ticket. 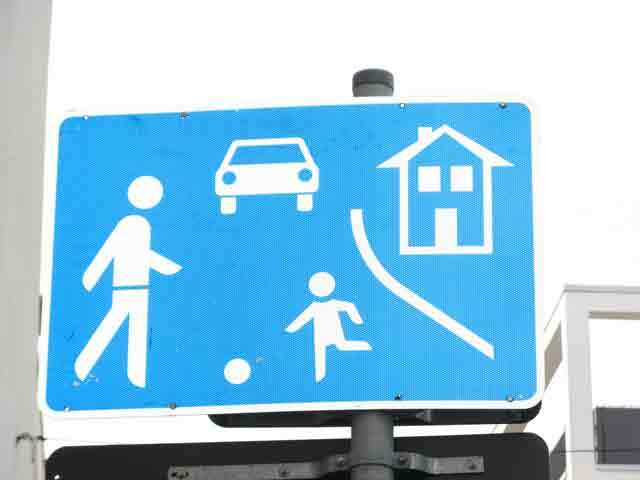 Common Traffic Signs: Now, let us review some of the more common street signs you will encounter. Just click any photograph to enlarge it. Then click your back arrow to return to this text. Click to enlarge most any photograph. The sign to the right is Arterial or Diamond Sign. You have right of way from cars approaching from side streets if you are on this street. The sign on the left is also an indication that you have the right-of-way but only at this intersection. At the next intersection on this street, if there is no such sign, you must yield to traffic coming from the right. Yielding to traffic from the right is the usual condition absent any signs to the contrary. 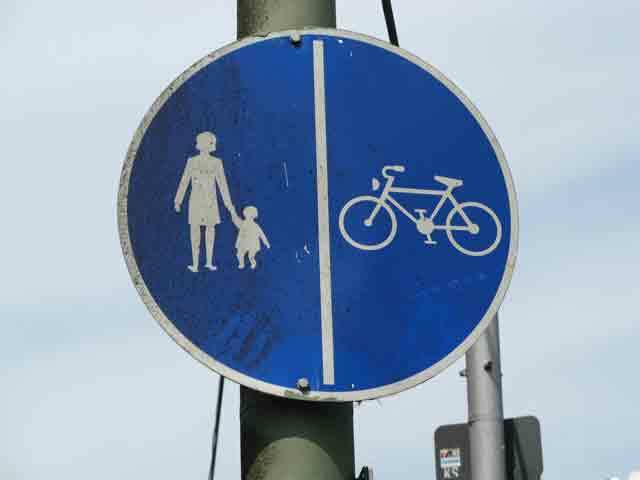 The sign to the left designates a pedestrian way but bicycles are allowed too. 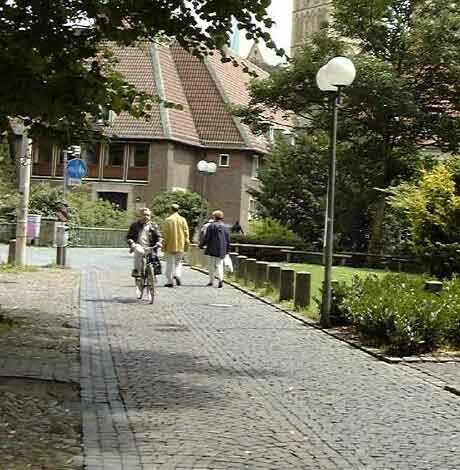 You should share the sidewalk with pedestrians and, if they do not see you, let them know with a short ring of your bell that you are approaching. Always yield to pedestrians. And, use your bell far enough away that you do not startle people. 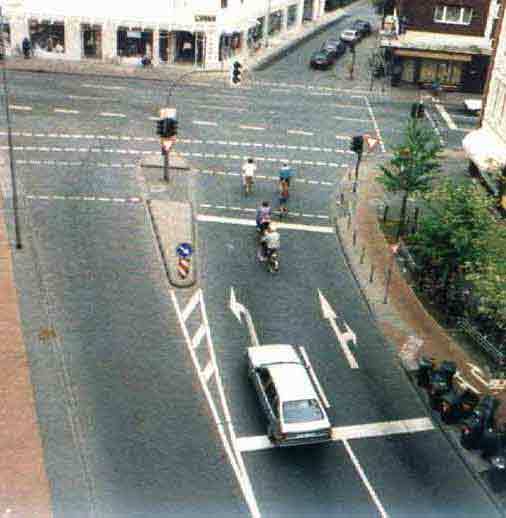 The same applies if the pedestrians and the bicycle are separated with a horizontal line. 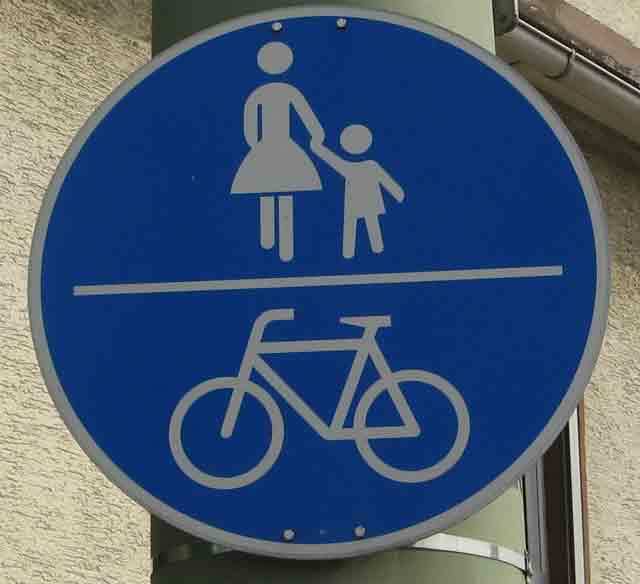 When the sign shows pedestrians and the bicycle separated by a vertical line, ride your bicycle on the designated path (usually colored red or green but always separated somehow from the pedestrian walkway. This sign means this is for pedestrians only, no bicycles allowed. This is the end of the bike lane. Use the street. Do not enter. The street is probably one-way coming toward you. Sometimes, you will see an additional sign similar to the one below the round pedestrian sign above. It indicates that bicycle riders can ignore the Do Not Enter sign but nevertheless, be alert that all lanes of traffic are coming towards you. The sign on the left is the start of a pedestrian-only zone. 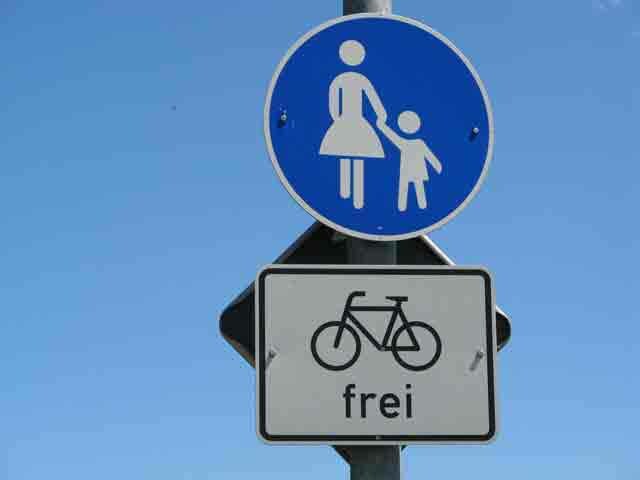 Unless you see a bicycle "Frei" sign below it, you should get down and push your bicycle. And with a red stripe through it like the one to the right means that the way ahead is not a pedestrian-only zone. Speaking of getting down from your bicycle, when farm equipment approaches, you are wise to dismount until it passes. This tractor has a grass mowing blade on the right side. Dangerous to cyclists. The caution sign with an exclamation mark is advisory and not a law. Beneath the sign it says cyclists dismount. These signs appear in places where there have been several bicycle accidents and therefore it is worthwhile to pay attention to it.